Faithful Thinkers- Defending God's Existence and Compatibility of Science with God and the Bible: Book Review: Has Christianity Failed You? One of the major obstacles that I come against in defending the Christian worldview is simply a misunderstanding of the worldview. So many times people tell me that they reject Christianity based on one thing or another that Christianity teaches. In the vast majority of the cases people are rejecting something that is not Christian but they believe is Christian. In "Has Christianity Failed You?" Ravi Zacharias tackles this exact issue. If emphasis could be added in a title, I would place it on "Christianity". He believes that it is not Christianity that has failed people, but what they think is Christianity. Ravi introduces his book by telling of an open forum on the topic of this book that he spoke. The audience was eager to hear what Ravi had to say about the apparent failures of Christianity, intellectually and emotionally. This book is his thoughts on the issue. If we are to discover if a worldview is what has actually failed us, we must understand what that worldview teaches. Ravi starts Chapter 1 with this thought. Since the Christian worldview is grounded in the life and teachings of Jesus of Nazareth, He is the focus of the first chapter. Ravi begins his discussion of Jesus by telling of man's attempts to put a human face to the person of Jesus. He tells of his experiences as a young boy in India, where his family had one artist's portrayal of Jesus hanging on their wall. One of the first problems that Ravi points out is that in man's drive to learn more about the human side of Jesus, "Too many have so humanized God and deified man that we can scarcely tell the difference any more." (pg 22). Ravi wishes to restore a balance between Jesus' humanity and his deity in his being the Messiah. He frames his discussion in the three ways that Jesus is a "Son": Son of David, Son of Man, and Son of God. He concludes by discussing Jesus' "Savior" aspect. As the Son of David, Zacharias explains how Jesus transcends ethnic, cultural, and political ideologies to be the Messiah, not just of the Jews, but of all people. As the Son of Man, he discusses the full humanity of Jesus. He refers the reader to Luke 4:18-21 (which quotes Isaiah 61:1) and Daniel 7:13-14 in support of the necessity of the Messiah's full humanity. In the section on Jesus as the Son of God, Zacharias focuses on Jesus' deity as the second person of the Trinity. He explains how "...the Christian message has the only answer to the greatest question in philosophy...How does one find unity in diversity?" (pg 39) Zacharias concludes Chapter 1 by showing that man needs a Savior to rescue him from the deception of his own heart. Zacharias begins Chapter 2 by explaining that we cannot really answer the question of the title of the book, by simply knowing who Jesus is. We must also know what it means to be a Christian. He frames this around the idea that is popular in today's culture that all religions are basically the same. If they are basically the same, then not only has Christianity failed us, but so has all the other religions. Zacharias wishes to make it clear that if we are to answer the question about failure with any true meaning, distinctions among the different religions must be understood. The existence of objective morality is the first on the list. Zacharias provides the standard moral argument, but goes into more detail about how morality involves only persons. He notes that the idea of "persons" in naturalism is not even sound, thus neither is objective morality. Next he discusses the evidence for God's existence. He discusses the conversion of atheist Antony Flew to deism due to the evidence. He follows that with a look at free will. He contends that, "if matter/energy is all there is then there is no free will. There is free will. therefore matter/energy is not all there is." Zacharias also takes a look at the relationship between man and reason for his existence. He commends followers of other religions for their acknowledgment that man cannot find the reason for his existence in himself, but derides naturalists for doing that very thing. Zacharias then goes on to explain three different "postures" that man can view human nature and ultimate reality: Sheer Determinism (the absence of free will), Total Transcendence (absolute objectivity), and Semitranscendence (combo of free will and objectivity). He argues that it is evident that man possesses free will and that absolute objectivity is not possible, so the view left is Semitranscendence. He then demonstrates how this posture fits perfectly in the Christian worldview. He relates this to a person's disillusionment with Christianity stating, "To be disappointed in Christianity, one really has to say, 'I am totally transcendent over reality and cannot see any ultimate purpose whatsoever.'" He concludes the chapter by stating that if one wishes to believe that life is totally random, they must dismiss the existence of the mind, which is the source of free will, and such dismissal is not reflective of reality. Zacharias begins chapter 3 by discussing trust. He points out that "it is always prudent to be cautious before trusting someone, because you don't always know whether they deserve you trust until it is too late." (71) The point being that we need to properly understand the past experiences with a person to know if trusting them is appropriate. A few pages in Zacharias identifies one of the key misunderstandings of Gods character that cause disillusionment: "...the lie that God makes everything comfortable for us..." (74). He then moves into the idea that God will perform miracles to entice us to believe in Him (another misunderstanding of God's character). He reminds the reader of biblical story of Lazarus and the rich man. After both had died- the rich man was in torment and Lazarus in Abraham's bossom, the rich man had requested that Lazarus go back to warn his brothers. However, Abraham stated that they had Moses and the prophets. If they did not believe them, they would not believe if a man rose from the dead to tell them. The issue of disbelief is not tied to the lack of miracles, but the heart that is bent on not believing. He describes a list of contradictory demands and beliefs that today's culture possesses. He points out that these cannot be met if man does "not understand the very context of why life is in the first place" (78). He transitions to the next section by stating that we must understand the context of why life is before we can understand the text (Scripture) of how to live life. Context is Zacharias' main point when discussing the reliability of the text. He mentions that many people have dropped their faith because of supposed contradictions in the Scriptures. He simply states that the apparent contradictions come up because of the failure to understand the context in which they were written. Moving past the reliability of the Scriptures, he proposes that those who would have the Scriptures shown contradictory are missing the the larger point: the fact that forty authors of sixty-six books with a timespan of 1500 years all converge on at a single point: Jesus Christ. This near impossibility is what needs to be explained from the worldview of those who reject Christianity. Zacharias then moves into life experiences. He points out that the struggles between our physical needs and our desires are merely felt. It seems ironic that we have such a demand for verification of the source that can resolve the struggle. if only our hearts would just be open to that Source. He then examines the fragility of the human physical and mental conditions and how it they are connected to mans metaphysical (or spiritual) beliefs. He mentions that many see the weakness of the human conditions (made apparent by pain and suffering of humanity) and conclude that its source must be randomness (a caring God would never have created such a weak being). But Zacharias points out that on the contrary, Christianity teaches that humanity, though "fearfully and wonderfully made" is weak because of his heart's will's inclination against his Creator- the spiritual condition affects the physical and mental conditions as much as vise-versa. Zacharias now moves into a discussion three primary areas that people believe Christianity has failed them: security, pain and suffering, and sexual fulfillment. He does not limit security to an absence of the potential for physical harm, he expands the concept to include simple human physical contact. He discusses the need for humans to be touched and the effects it has on us psychologically if we are or are not. He ties this need to many people's perception that the Christian God has failed in this area- God is transcendent and cannot provide such security. In discussing man's need for security, Zacharias points out that what drives that need in many cases is the fact that we are experiencing pain or are suffering. He touches this topic shortly here because it will be discussed in greater detail later. Zacharias, though, focuses on the Church's failing to meet people's needs when they are in pain or suffering. The individuals of the Church are not there to provide the security that a person needs when they are struggling. Zacharias tells the reader that: "Marriage has been redefined, because God's place has been redefined. Commitment in marriage has suffered because our commitments to God have suffered." Christianity has not failed us, we have failed the Christian God. In the context of man's nature, our failing (not just in this way) is to be expected- thus the need for Christ's sacrifice for us. However, knowing this does not permit us live apathetically about our behaviors, remember: we fail God because He is not in the place of our lives that He should be. Continual failure reinforces to God and the world that He is not of concern to you. In Chapter 4 Zacharias zooms in on the issue of pain and suffering in the lives of people. He opens the chapter with two anecdotes about how people deal with evil: the first to illustrate that its existence is denied; the second to show that is justified in light of other evil; and both to show that those options were unsatisfactory to the person involved. He uses the story of the blind man's healing from John 9 to establish the reason for and how to deal with pain and suffering in the world. He notes that Jesus stated that the reason for the man's blindness was "so that the works of God might be seen in him" (9:3b). Zacharias states that at this point we must discover what the "works of God" actually are to understand the purpose of pain and suffering. Zacharias examines the healing of the blind man through three different perspectives: the healed man, his friends and family, and the religious leaders. Zacharias reminds the reader of Job and his struggle to find the reason for his pain and suffering. There will always be questions that we can come up with that may remain unanswered about suffering in our lives. The work of God in Job's life (and the blind man and us) is to bring us to a fuller knowledge of and reliance upon Him. "[Job] starts his journey toward finding his answer for suffering and pain from the assumption of God as the Creator and Designer to seeing God as the Revealer of Truth, to recognizing him as Redeemer and Savior, and finally to experiencing him as the Restorer and Comforter." Answers do exist for questions about pain and suffering, but all of our questions about the reasons behind our suffering do not require an adequate answer for the works of God to be accomplished in our lives. The accomplishment of the works of God can be done only if we allow God to work in our lives through our pain and suffering. He ends the chapter with a note relating back to the moral argument for God's existence. If someone wishes to leave the faith because of the evil in the world, they will be taking on a heavier problem: the problem of explaining how good exists without a solid foundation (God). In Chapter 5 Zacharias turns his attention to the claim that Christianity stands in direct opposition to rationality. He uses Robert M. Price's book The Reason Driven Life as his source for critiquing this false belief. He starts by pointing out the fallacies in the foreword to the book, written by Saturday Night Live star Julia Sweeny. This really set the intellectual tone for the rest of the chapter on a book about reason. Zacharias moves directly into the issue with overgeneralizing that Price makes. Simply put, since the many gods of the religions of the world can be demonstrated to have a few things in common, if you can show that one god does not exist, then you have shown that none of them do. Zacharias then moves to quickly go over the basic laws of logic. He then shows that Price has violated them by stating that he does not wish to change the minds of his readers about Christianity, but he wishes to define his own morality then impose it on everyone else. Zacharias points out that this also is simply trading the perceived totalitarianism of Christianity for the actual totalitarianism of secularism. Zacharias then poses the question of why Price chose to question the validity of Christianity and not Islam or Hinduism. In answering this, he looks at the happenings surrounding those who have questioned these. He also makes mention of the fates of skeptics of naturalism. He concludes that it is because Christians do not react in such ways that make it an easy target. However, Zacharias further concludes that the lack of reaction on the part of Christians is evidence of their confidence in the truth of Christianity and the ability to defend it in the public square. Zacharias looks at Price's way of interpreting texts of different religions. He goes into the lack of cultural understanding that differentiates many texts that Price lumps together as being essentially the same. He concludes the chapter by looking at the conclusions that Price arrives at: that man must assume the place of God; that the conclusion of this life is the conclusion of existence; and that man is not more than a physicality. He looks at the implications of each of these and demonstrates how they stand is stark contrast to reason and experience, which is the exact opposite of the goal of Price's book. In Chapter 6 Zacharias looks at prayer. He begins the chapter by reminding the reader that unanswered questions are not the same as contradictions in a worldview: "Christianity does not promise that you will have every question fully answered to your satisfaction before you die, but the answers it gives are consistently consistent." Like the other chapters he a few stories to set the tone. He tells two contrasting stories: one in which a prayer was answered, and one that prayers were not. He makes it clear that some prayers get answered and others are not. Zacharias then examines the next line of The Lord's Prayer: "Hallowed be your name". He states that man has forgotten to revere the name of God. It is used so flippantly in our everyday lives that it has lost all depth of significance in our prayers. We do not show respect and humility when we approach God in prayer. The following part of The Lord's Prayer: "Your kingdom come," is a submission of our will to God's will. Zacharias reminds us that we can only see shortly into the future- we live from day to day, one at a time. If we approach God as He is to be approached He will provide us the strength to endure His molding of us into the image of His Son. Zacharias acknowledges that aligning ourselves to God will through prayer is not an easy task. It must be constantly on our minds, and we must be actively seeking His will. If we understand the purpose of prayer, it makes the "unanswered" prayers easier to swallow. In Chapter 7, Zacharias begins to wrap things up. He starts the chapter by telling the reader, "Without a Savior, there is no one to save you from yourself, no one who knows you completely yet loves you unconditionally." This is the message of Christianity. It is a message with vital truth. Because of that Zacharias turns attention in this chapter to the Church. He points out that when unbelievers come to our churches, they tend to find people who are uninformed about their beliefs, unrealistic in their expectations, and overly judgmental of those who falter. He makes the point that the Bible has never taught that people inside the Church are any "better" morally than those outside the Church. When unbelievers see this as evidence against the value (and even validity) of Christianity, they are incorrect. He stresses the importance of understanding the concept of "forgiveness". The fact that those in the Church often act as if they have no hint of it towards their brethren provides a "sneak preview" of what those outside have to look forward to when they come in and make a mistake. He states that there is a difference between those who do evil in conscious defiance of God, and those who fall, yet seek forgiveness and reconciliation with God and other believers. This difference needs to be recognized, and acted upon in the Church. Zacharias does not overlook secular society, though. He mentions that in politics, people have no problem holding those of the opposing party to higher moral standards than their own all the time. Even those who claim that morality is all relative still wish to utilize an objective standard to judge others. Such moral hypocrisy is not a church-exclusive- as many like to believe, then use as a reason to believe that Christianity is not true...I refer the reader back to Zacharias' previous reminder that the Bible never claims that Christians are any better morally than the rest of the world- everyone is a sinner. The Bible exhorts Christians to be better. This observation just means that Christians have failed- not Christianity. In many cases today, unbelievers find a compromised message or just a place to go for weekend entertainment. These churches have altered the message of Christianity to the point that it is indistinguishable from everyday living outside the Church. This message has no saving power, and the person who accepts it is receiving no "good news" at all. These churches are sterile. Churches that focus on the entertainment factor rather than the message are just an alternative to watching TV or going to "game night" at a friend's house- there is little reflection on who we really are, our problem, or the Solution. Zacharias calls Church leaders and members to reverse these trends and get back to providing a message that will positively affect people's eternity, yet not become impotent in its methods of doing so. Zacharias then shifts focus to the individual- what it means to be a Christian. He starts by describing three "glories" of God that man should dwell on: His creation, His law, and the Incarnation. He then goes to three trusts that we have been given by God- out bodies, our minds, and our souls- to care for. Zacharias then discusses the three "excellencies" that the apostle Paul spoke of: faith, hope, and love. He states that only if God exists, can any of those be meaningful; and if He does exist, they are imperative. He finishes his discussion by informs the reader that there are two options. The first is to surrender to Jesus Christ and live a purpose-filled and victorious life. The second is to reject Jesus Christ based on the failures of the Church, and live a purposeless with no meaning. He concludes his book by reminding the reader that they are not alone. Many have had this same struggle, yet placed their faith in Christ, and He has given them lives of purpose, direction, meaning, and hope for the future. If Christ can do it for them, He do it for you too. "Has Christianity Failed You" has been a great book. 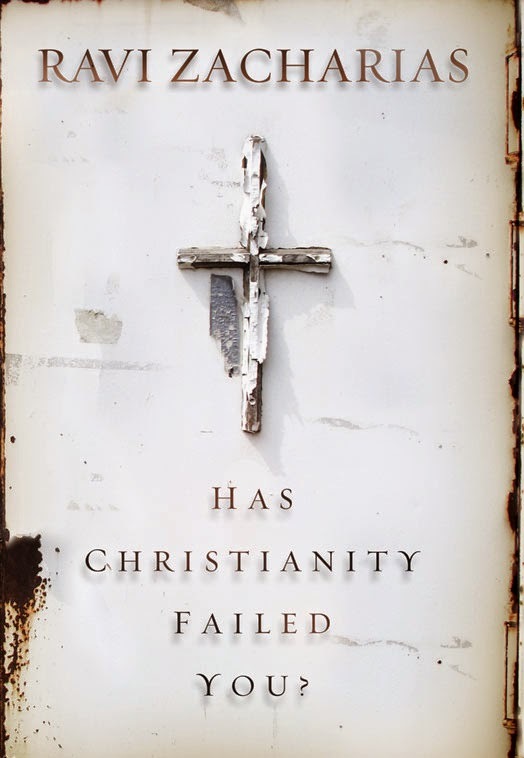 Obviously I recommend it for those who feel that Christianity has failed, but I also recommend it for every Christian out there- especially those in a position of leadership (be it in your family, your church, or among your friends). Even though I am a firm Christian, it has helped me to recognize where I do still fail, and those outside the faith see it and turn away. To them my life is Christianity acted out; if I do not take it seriously, they don't see a reason to either. Here is Dr. Zacharias in his own words about this book.